3 - 4 Person / 15 - 20 min show. When your client asks for something that people have never seen before ... a Wow Factor like no other ... you now say YES! 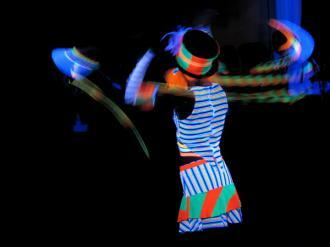 The Graphic Glow Circus Show steps light performance up to the next level of visual and technological amazement. Bringing together Ultra Violet light, Circus Skills and Graphic Poi Performance - electrifying light trails, hypnotic movement , high level skills and high definition graphics, this state of the art show is leaving audiences all over Australia speechless. 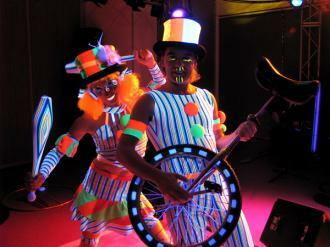 Ultra Violet Light / Glow Performance utilises ultra violet light and darkness to reveal a magnificent scene of circus characters within a glowing, spiralling kaleidoscope of moving light. Combining the dynamix of circus and dance skills - including hooping, juggling, pois and acrobatics, with theatrical interaction, a captivating "out of this world” effect is experienced to awaken the senses to the magic of life itself. An explosion of iridescent light moves within and around a Vaudeville Styled Ultra Violet world of delight and beauty. A visual feast for young and old. 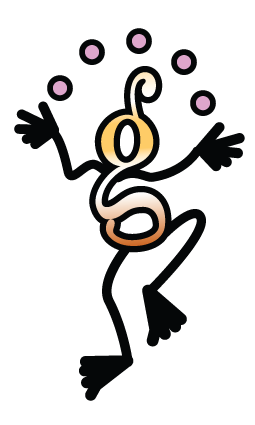 Graphic Poi are state of the art light equipment that paint intricate graphic imagery around performers as they perform choreographed routines. Revealing high definition graphics, we can customize and program, with precision, to display company logos / graphic text and complex imagery, creating a completely specialized performance for your event. Explosive and completely absorbing, this technological dreamscape of unlimited and unimaginable proportions will create sensory overload to blow your audience away !! combine with a punchy up beat dance to bring a whole other dimension to your event. * Ultra Violet Lights Required (min. 4 UV Tubes around stage area or 2 x Canons) - If UV Lights are unable to be provided by production team, our team can provide for an extra fee. *Area in which show is taking place to be in the dark (no surrounding in house lighting/natural lighting.) Without Darkness the Ultra Violet light effect can not take place.